What Size Generator Do I Need For RV Camper? How To Choose A Generator For RV Camping? How To Install RV Generator? 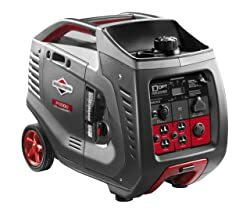 Will the portable generator charge the house battery? Is it fine to run the RV generator for only a few minutes? Can I use it for additional power while hooked up to a shore power? 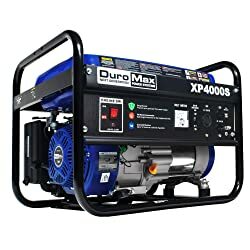 What Size Generator For 30 Amp RV? 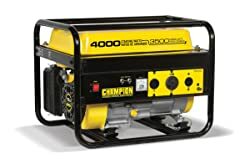 What Size Generator For 50 Amp RV? How To Quiet RV Generator? What Oil For RV Generator? Can RV Generator Run While Driving? Can You Run An RV Generator In The Rain? The best generator for RV can make your RVing life easier and more enjoyable. It supplies clean and safe power even to sensitive electronics, including tablets, blenders, microwave ovens, laptops and ACs. If you’re shopping around for the best RV generator, keep reading this guide to make a good buying decision later. There are many types of recreational vehicle generators that you can choose from and use in your rig. It is crucial that you learn about them in order to make a good buying decision. Know that the type of portable generator and its power to supply have to do with the satisfaction you will get from using it. Choosing the wrong type, size and specifications will ruin your experience and not give you the most of investment. In order to select the right one, check out the following for the types of generators for the camper, travel trailer, motorhome, cabin or home. Inverter generators, which are considered the quietest units, come in different wattages. Some of them are in 2200 watts, others in 3400 watts and some in 6500 watts. 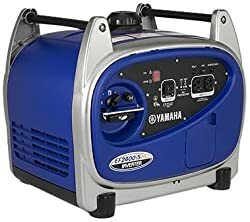 Inverter generators are great choices for camping, recreational vehicle, tailgating and other applications because they offer clean and smooth power, even ideal for computers and other sensitive equipment onboard. Inverter generators can be used to charge RV batteries or replace solar charging when needed. They can also supply power even to high wattage appliances, such as an air conditioning unit or a microwave oven to which a battery cannot supply power. These generators also have an amazing technology, such as special mufflers, sound-dampening technologies and quieter engines. An RV portable generator, as the name implies, is a type of generator, which is usually easy to transport for their carrying handles and transport wheels. Just like inverter generators, they can charge your house batteries or can supply direct power for 120 AC outlets where you’re plugging your oven toaster, microwave and hairdryer. The portable generator fits small RV space, while at the same time possesses a powerful engine. It is also efficient for working with less fuel. Nevertheless, a portable recreational vehicle generator is an efficient power source available in different wattages. Choose one based on your rig’s power supply requirements. Aside from generator types, including inverter or portable generators, you should know that these power sources are also grouped according to their fuel types. The fuel refers to what the gen set needs to operate in order to supply power to your RV appliances and electronics onboard. It is the exact reason to know the different types of fuel that a gen set can run with, so that you can decide which one is the ideal choice. For example, if you’re using diesel on your rig, then you might want to go for the diesel type, and so on. For a guide on the types of generator fuels, keep reading. The diesel-powered set runs on diesel that can burn cleaner and emit less fumes and emissions than a gasoline does. This type can also produce more power than propane does. As a general rule of thumb, you might want to go for this type if your rig is running on the same fuel for convenience in refilling. After all, diesel is also safer to store and non-explosive. You can choose from one of the efficient models running on a diesel for your camper, motorhome or cabin. On a little drawback, diesel generators can be noisier than the rest of the types based on fuel used. Would you like to use liquid propane RV generator? This type has a longer shelf life although produces about 10 percent less power versus diesel or gas does. But then, the liquid propane for a generator is cleaner and environment-friendly aside from this type of generator having a longer shelf life. 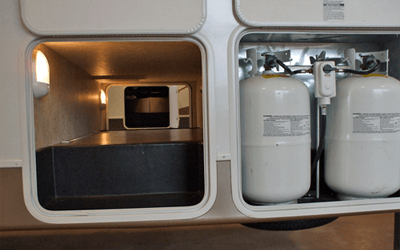 Another thing to know is that propane types are preferred by RV owners who don’t want their fuel going bad because propane has an indefinite shelf life. When it comes to emissions, it also produces little emission. On a negative, propane generators have a large tank size and are hard to refuel everywhere. Gasoline-powered generators are affordable, so they’re common choice for RV owners on a budget. No wonder, its fuel, gasoline, is also cheap. It is also more accessible than propane is. The gasoline-type of generators is also common among RV owners who want to refuel more conveniently. However, you must know that gasoline is highly flammable, burning faster than diesel does. It also has shorter shelf life and consumes more fuel than a diesel does. Also, gasoline has a short expiration date. It must not also be stored in the RV or garage due to fire hazard. 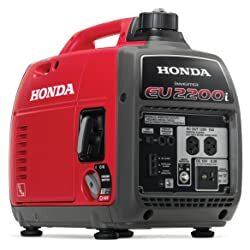 The Honda EU2200i Inverter Generator is one of the most reliable inverter generators on the market. It supplies 2200 watts and 120V perfect for your appliances and electronics. The gen set is also one of the quietest around, operating at only around 48 to 57 dB. The EU2200i is good for plenty of applications, including camping, backup power source and other outdoor activities that need a quiet generator. This model can be added to another same model generator for more power reaching up to 4400 watts. The EU2200i also runs with excellent fuel efficiency, running almost 10 hours only on a single tank, but that depends on your load. Finally, it is perfect for overnight power source and long-time applications. If you’re looking for a small but a top performing RV generator, you might want to take a look at the Yamaha EF2400iSHC. It offers improved AC starting power and increased motor starting capability than other models do. It is not just a reliable power source but also offers clean operation versus commercial power. The Yamaha EF2400iSHC is also a smart unit that knows how to adjust automatically based on its load. The gen set can also prevent damage to save you money on repairs and has the ability of minimizing downtime. And when it comes to improved efficiency, you can also rely on the Yamaha model that offers not just clean and reliable power but also a longer engine life even with continued and heavy use. Finally, I liked that it can run most RV air conditioners of up to 13,500 BTU along with convection ovens. Camping will become more enjoyable when you have the Champion Power Equipment 100263 by your side. It is the best RV generator for recreational vehicle camping especially when there is no electrical hookup available in the camping ground. It offers up to 3400 watts of power and can run on either propane or gasoline, giving you more convenience to use whichever fuel is available at the moment. You’ll also find it convenient to operate for its three different position switches for a quick and easy start. The gen set also comes with a quick touch panel for ease in controlling the gen set in one location. It is also one of the quietest around to operate with only 59 dBA useful for tailgating and RVing. Finally, I liked that it supplies clean power to sensitive RV electronics. 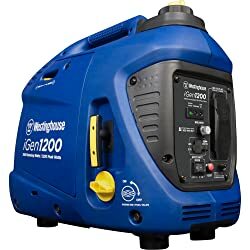 If you’re shopping around for a great portable inverter generator for the money, then you might want to take a look at the Westinghouse iGen1200. It is one of the best in its class for its optimum performance at an affordable price. This product is also lightweight at only 35 lbs and runs on cost-effective gasoline fuel. It is also versatile for use in homes during a power outage. When it comes to quiet operation, it runs at only 52 dB, one thing that makes it a standout among other choices on the market. And on a single tank, it can run up to 10 hours depending on its load. Nevertheless, the Westinghouse iGen1200 is one of the most cost-effective generators for the RV for its long running time and affordable gasoline fuel. If you’re shopping around for the right generator for your camping trailer, you should not miss the Briggs & Stratton 30545 P3000, one of the top picks in the category for its efficiency and reliability. On a single 1.5-gallon tank and at ¼ of its load capacity, it can run for up to 10 hours, with running amps of 21.7 amps. Another impressive quality of the model for camping trailer is its ability to supply clean and stable power even for your sensitive appliances, including an AC or microwave oven. It also works quieter than other camping generators on the market now. This model also comes with four pieces of household outlets, giving you more options in plugging your RV appliances. Finally, I liked that it comes with a 2-year limited warranty. Are you looking for an RV generator that you can easily transport from one place to another? You might not have to look any further if you have the DuroMax XP4400E. The gas-powered generator is not only easy to bring anywhere, but it also runs on affordable gasoline fuel. 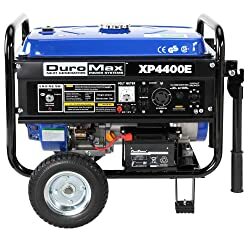 It’s one of the best portable generators to supply power for emergencies and camping adventures. It can offer a rated output reaching an average of 3500 watts and max 4400 watts that is enough in supplying power to your RV or small cabin or house. When camping, you also need a portable generator to work quietly, and this one is a great choice for emitting only 69 dB of noise. At 50% load, this model can also run for up to 8 hours. The WEN 56200i is one of the best choices if you’re looking for a quiet generator. Did you know that it could operate with only 51 dB at its ¼ load? With it, you don’t have to worry about waking up your neighbors or fellows in the campsite. The four-stroke engine works quieter than a window AC. It can minimize the noise so effectively that it’s valuable for restoring backup power, hunting, tailgating and camping. But aside from being the best quiet generator for the recreational vehicle, it also supplies clean power without voltage drops and spikes due to its below under 1.2% of harmonic distortion at full load and below 0.3% at zero load. Overall, it is a quiet generator that offers safe power supply for tablets, cellular phones and laptops, among other sensitive devices onboard. Shopping around for the best generator for RV for the travel trailer is a challenge, but not if you’d take a second look at the DuroMax XP4000S. It is one of the finest travel trailer generators around for providing up to eight hours of run time, ensuring of continued clean power supply to our sensitive electronics and appliances onboard. The gasoline-operated generator is professional-grade gen set designed with the brand’s fully loaded power panel that controls the generator. Travel trailer camping with the 4000-watt gen set is sure to be fun because it is reliable to operate even air conditioners and air compressors. I also liked its ease of operation for its full power panel with a circuit breaker, voltmeter, warning lights and power outlets. Combining portability and affordability, it’s the Champion 46596 for you. The 3500-watt model is our top pick for its powerful 196cc engine that operates at 68 dBA and is able to supply up to 12 hours or runtime at its 50% load. The portable generator also offers intelligent features, including Intelligauge and VoltGuard. Portability also means efficiency, and this gen set passes that standard. It has a low oil shut off and recoil start feature that gives you ease of use. 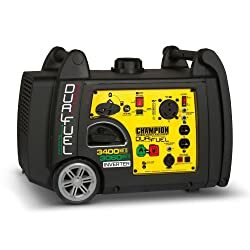 The Champion Power Equipment 46596, overall, is our top choice for its superior portability and top performance with 4000 starting and 3500 running watts. 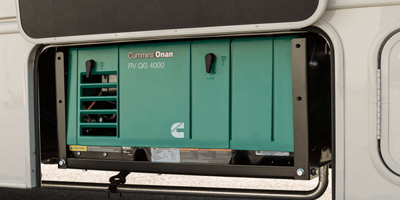 Making sure that a generator is parallel ready is one of the things to bear in mind when shopping around for an RV generator to ensure that you can connect the same model generator for additional power supply whenever needed. That’s what the Generac GP2200i can offer us. It has a parallel capability that lets us connect two gen sets to run our portable appliances, AC, lights and cellular phones via USB port and other appliances at the same time. And if you’re planning to use the gen set for open-air events and festivities, being parallel ready is also a convenient feature not to miss. I also liked that the compact and quiet inverter generator offers clean and safe power source for its Truepower technology. One of the worst things in the world is to end up buying an undersized or oversized generator for your needs. For example, you might not get enough power to support your appliances and RV electronics if you settle for a too small generator. On the other hand, it is as bad as an oversized generator that proves less valuable if the power it supplies is more than what you need. You need to be careful so that you can save yourself from headache and some money. To start, take note of all the 120V appliances that you need to run, and remember that your AC will require the biggest chunk of the power. An AC also has a higher starting wattage versus its running wattage. Get the total power requirements of the appliances you need to operate at the same time. You should also take note of the running wattage for each along with the starting wattage of your RV aircon. The sum of this computation will be the average wattage you need. As another tip, you might also want to take a look at the owner’s manual or the sticker attached to each appliance to determine the wattage draw of each appliance. One of the most important factors when buying a new RV generator is its noise level, which is determined by its decibel rating. It is used in measuring the sound intensity that the unit can emit. On a decibel scale, the littlest audible sound is 0 dB, which is also the tiniest sound audible to the human ear. In general, we can perceive a sound to be 2 times louder than another one when each of the sources is almost 10 dB apart. As an example, an RV gen set rated at 70 dB will produce sound twice as loud as its 60 dB counterpart does. And in another example, an 80 dB gen set is going to sound almost 4X as loud as what a 60 dB generator can produce. The best RV generator for camping is what you need if you’re looking to enjoy the experience. As you know, there is nothing more frustrating than to have no power supply in the campsite without a hookup or in a remote, undeveloped place. 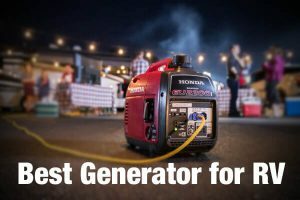 But if you’re choosing a good generator for camping, what are the features to consider? 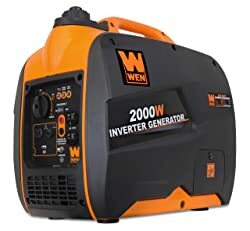 Parallel capability: It must have this capability to ensure you can connect two portable generators to double the power. Low oil monitor: Check that the generator’s engine will turn off automatically if it detects low oil to prevent damage. Power output: Check it on the wattage rating. What is its max power for up to 30 minutes? You must also look for the rated power, which is how much power it can produce for a long period of time. For example, some compact and portable gen sets are rated with 1000W power, ideal for small lights, TVs and fans. 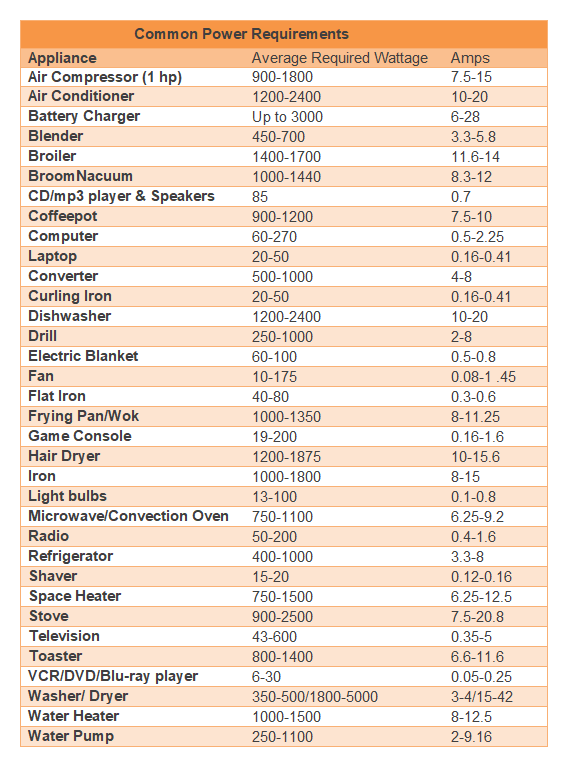 Others are with 2000W for microwave ovens, electric grills and hair dryers. Compare based on your power requirements and figure out your wattage needs for a generator. Weight: Without fuel or gas, what is its dry weight? Portable and handy, these two things are important for an RV generator. You should know how much weight the set has without fuel on its tank. Circuit protection: It is important to ensure generator protection by shutting off the AC power once there short occurs or the load draw is too much. Operation time or runtime: How many hours can the generator run before it needs refueling? However, some manufacturers state only the run time at ¼ of its load. Be able to compare the specs well and consider them only as a reference. 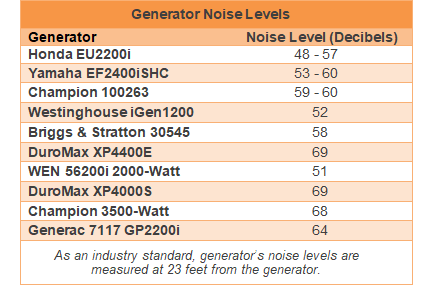 Noise level: One of the things to look for is noise level to ensure the gen set does not only operate efficiently but also quietly. Otherwise, it will be nuisance not only for you but also for other people in the camping ground. Some gen sets are rated between 53 and 59 dBA at ¼ of its load. Be able to compare based on its full rated load to know how loud really it operates. The following is a quick guide on how to install the RV generator. Refer to it if you’re looking to install correctly. Find the best spot to install it in your RV. Do you have a travel trailer? You might want to consider putting it on the A frame located at your vehicle’s front side, near the hitch and behind a propane tank. Next, you must mount the portable generator by attaching it to the RV’s platform. If the A frame of your travel trailer is where you’re going to mount the platform, you can place U-bolts over the frame and through the mesh. However, put the U-bolts through the mesh in the platform’s bottom if you’re going to install the platform on the rear bumper. Be sure to secure the U-bolts around the support structure of the meta channel. Put the generator on the platform, but its weight must be on the center of this platform. Secure the gen set to the platform. Place bolts through the holes at the base of the generator if it has those in order to secure the gen set. Alternatively, you can use ratchet straps if the gen set has no holes on its base. 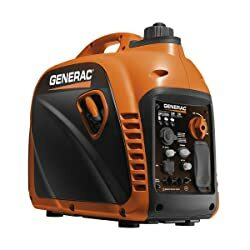 Hook the straps to the mesh bottom of the platform, and then run those straps over the top of your generator and then be sure to tighten them. The next thing to do is to wire your generator based on how you want the system to be automated. Plug the shore power cord into the receptacle of the generator, one of the simplest methods to wire it. Alternatively, you can wire it through a transfer switch that lets you connect two AC power sources. Follow this process to install your generator. You may also check the instruction manual for any additional or specific maker instructions. Yes, it can but not directly. What the generator basically does is to supply power in order to run your onboard charger/converter that charges the batteries. Generally, it must run for an average of 30 minutes so that it can warm up. When it’s warmed up, it can run for a 5-minute interval that will be fine. The connection of both power sources should not be done because it is unsafe. It is because electrical systems work to keep a campsite’s power source and generator power separate. The 3000W generator set will basically supply power to your 30Amp RV without any problem. It can also run the air conditioning unit, microwave, blender and other appliances safely because it can deliver clean power that prevents voltage surges and drops. It can prevent the damage to your RV appliances and electronics, too. This large generator size is also good for its quiet operation and easy electric start. Overall, you must pick the generator size for your 30-amp rig by calculating your power requirements by totaling the wattage needs of those appliances to operate correctly. 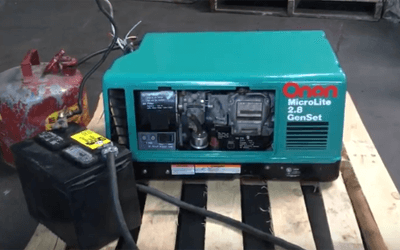 In all cases, you must choose a generator with enough wattage to keep up with your 50-amp rig to ensure that it can handle the power needs of the devices, appliances and electronics onboard. As like with a 30-amp RV, you should determine and total the starting wattage requirements of those devices onboard so that you can pick the correct generator wattage. Also, you have to remember that bigger generators are higher power ones, and it is one feature you might also have to look into when picking the right size for your 50-amp vehicle. The RV generator can be noisy, depending on its decibel rating, but there are ways to quiet a noisy set. Two of the most popular materials to silence a generator is the use of cardboards or rubber pads used to wrap around the generator to minimize its noise level. For some, they make use of padding under the generator. Others just install the generator under the truck. All these methods have the goal of minimizing the vibrations to make the generator quieter. Rubber pads or cardboards, among other items, is used to divert the noise it generates into another direction away from our ears. You should use engine oil to lubricate the generator engine and grease for the bearings. For a marine type or large generator, you might want to opt for turbine oil. Fuel additives, however, are for the fuel. On the other hand, you must use coolants or anti-freeze oil for the radiator of your RV generator. And for the generator set, you should use API CJ or CI-4 or CH diesel engine lubricant or oil. If you’re living in a country with four seasons, you might want to consider a SAE 10W40 – 15W40 diesel engine oil along with a coolant that has glycol for antifreeze feature. Yes, using a portable RV generator is okay while driving, but then it might be better if the set is a built-in generator. So this answer is not suitable for all RV owners because many have external or portable generators to power their appliances. While it can be okay to run the external RV generator while driving, you should still take precautions and proper care. The bottom line here is that it’s your discretion to run the portable generator while driving, but you must check specific manufacturer warnings or directions regarding its use while going down the road. No, it is unsafe to run the best RV generator while in wet conditions, such as snow or rain. It must also not be used near a sprinkler system or a pool. You must not also operate it if your hands are wet or else you might be electrocuted when its electrical panel gets wet. If you want to keep yourself safe and your RV generator undamaged, you should not run it in wet conditions. Remember, it has electrical components that can cause accidents to you or your loved ones. The generator might also stop working if its electrical components are damaged due to wetness.